Car Dealerships - 39 percent"
Okay, so that study dates back to 2011. Still, I can't imagine nasty bathrooms becoming any more acceptable. Can you? Just think of your own reactions. In fact, I'd expect bad retail bathrooms to be even less tolerated now. Beware Bad Online Reviews, Too! "Another Harris Interactive poll, summarized in USA Today, has shown the new difficulties that businesses face in light of the rise of social media and online review websites. The survey found that 50% of people who encounter a dirty restroom would discuss it with friends and family. These type of reviews can cost a business customers before many of them even set foot in the door. So, basically dirty restrooms lead to lost businesses." "86 percent of U.S. adults equate the cleanliness of a restaurant's restroom with the cleanliness of its kitchen. The survey also revealed that 75 percent of U.S. adults would not return to a restaurant with dirty restrooms. 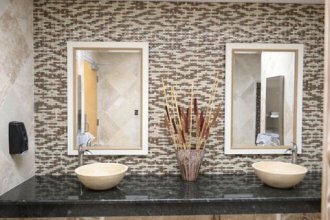 Regardless of industry, clean restrooms directly impact a business' ability to attract and retain customers." 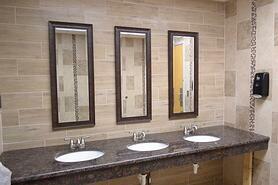 Clean bathrooms suggest many positive things to customers. That the establishment itself is clean. That it pays attention to details. That it takes customers and their experience seriously. That it wants customers to relax. That customers can trust the business to take care of its customers. What else? Yes, Beautiful Bathrooms Affect Retail Experience! Here are several examples of retailers who get that beautiful bathrooms make for great retail experiences. Tile Outlets of America has stores in Fort Myers, Sarasota and Tampa and sells tile, stone, mosaics, cabinetry and more. In all three stores, you'll find stunning men's and women's rooms. They get that they don't want to lose 45% of their traffic who might be offended by boring, dirty-looking, uninspiring bathrooms. They appreciate that their bathrooms are part of their store's retail experience. They are counting on their "restrooms having become an extension of the Inspiration Center and another way to help customers visualize what they can do in their homes." "Even though the old restrooms were cleaned three times a week by an outside service they never felt clean because of the worn condition. I think generally customers relate the cleanliness and overall condition of the restroom to the rest of their visit and the type of service they expect to receive. 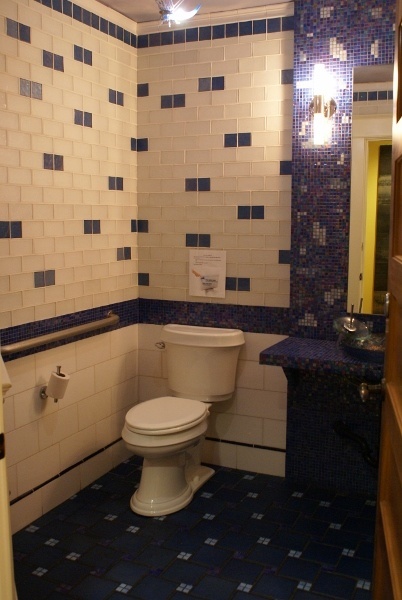 Now customers can enjoy bright, clean, and stylish restrooms." You can read about the Fort Myers store bathroom remodel in New Bathrooms for Tile Outlets of America Fort Myers: Bathroom Blogfest. A retailer friend explained to me that bathrooms in a retail environment are the one space closest to being like one in a customers' home. By focusing attention of bathrooms, you communicate to customers that you know what's important to them and that you can help them. You can demonstrate how your products look in that space and also how they perform. If you're in a business that sells materials that need to look good, don't overlook your bathrooms! They might be your ultimate selling space. Another retailer friend who gets it is Judith Huck from Classique Floors + Tile in Portland, Oregon. She uses her store bathrooms to showcase creativity as well as products and generate conversation with customers. Consumers - both women and men - prefer clean bathrooms. They are also increasingly stressed as both juggle doing more in the same amount of time. Add mobile devices, the always-connected, always-on mentality, perhaps throw in a few kids, aging parents, don't forget work, and the stress level becomes intense. How Are They Alleviating the Stress? As customers create their own relaxing havens, their standards rise dramatically. As they do, so do expectations for better bathroom experiences wherever and whenever they go to spend money. Bathrooms are fast evolving beyond basics to the next level. Retailers: are you ready? 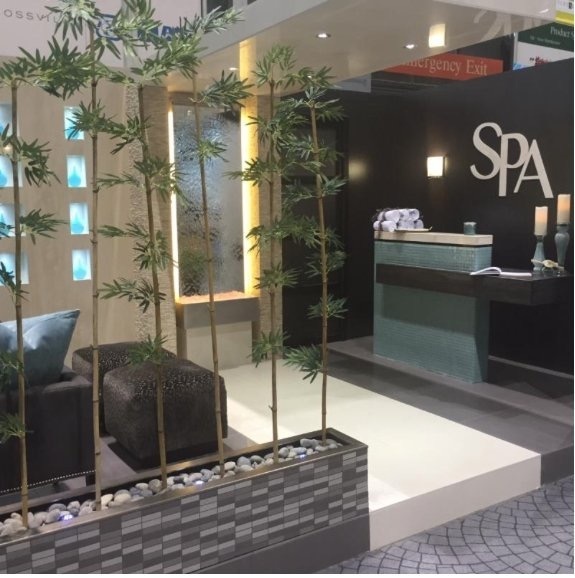 20 million people visit spas per year and 51% only started going in the past 5 years! Consumers value control/simplicity, balance/nature, customization/escape which translate into efficient, accessible spaces using technology and innovative design. To highlight the relevance of this spa trend - or taking bathrooms to the next level -The Dallas Morning News wrote on 06/13/2007 an article titled "Many stores now offer spa services" (sadly no longer available) which mentioned Whole Foods, JC Penney, Coldwater Creek, the airport and the car wash.
Retail Bathrooms for Stress Relief? Stressed customers do not make ideal shoppers. Why? Because stressed customers have difficulty relaxing, forgetting about obligations and losing track of time. As a retailer, you have a vested interest in a relaxed customer who will spend more time in your environment, thinking about possibilities and eventually buying. And then, find every opportunity to feast the senses so your retail visitors feel comfortable spending time with you and your people. That's if you're looking to be successful. "Retailers' success today is not so much what they sell, but how they sell it. Shopper engagement is the buzzword, and creating opportunities for shopper interaction is how to do it. The challenge for retailers is to make their stores more interactive for the customer, which will increase the time they spend in the store. This is what experience retail is all about." Clean bathrooms are an ultimate sign of retail hospitality. 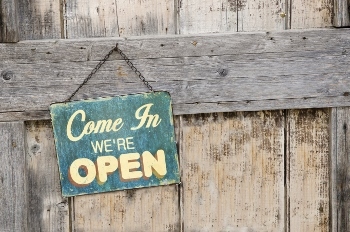 They signal that you welcome your shoppers to your store and want them to be comfortable. They can also play a role in increasing the level of engagement shoppers have with your product, not to mention create a compelling topic for conversation with your people. How Will You Transform Your Retail Experience? Which retail bathrooms have you come across that affected your own experience? 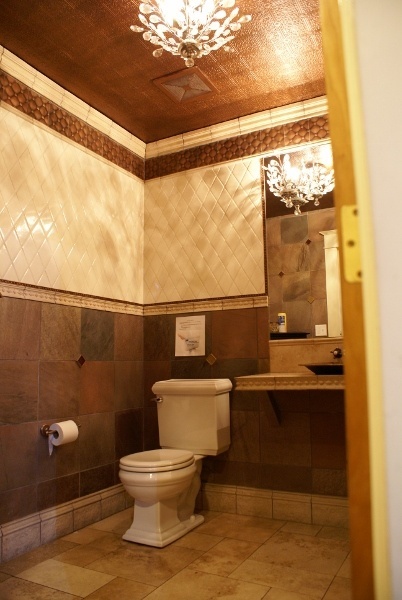 As a store owner, have you given much thought to your bathrooms? How might you transform them to create a more welcoming and relaxing experience for your shoppers? Note: This article was originally published on 3/12/2013 and has been updated.